Periodically the clan organises a Clan Rally. The aim of this occasion is to introduce members, and non-members, to one another and to come together socially in a spirit of friendship and kinship. It is a weekend of social interaction, with learning, song, music and dance. We endeavour to organise seminars, workshops on genealogy, history lectures, historical tours etc. The evenings are filled with entertainment, or you are free to do your own thing. 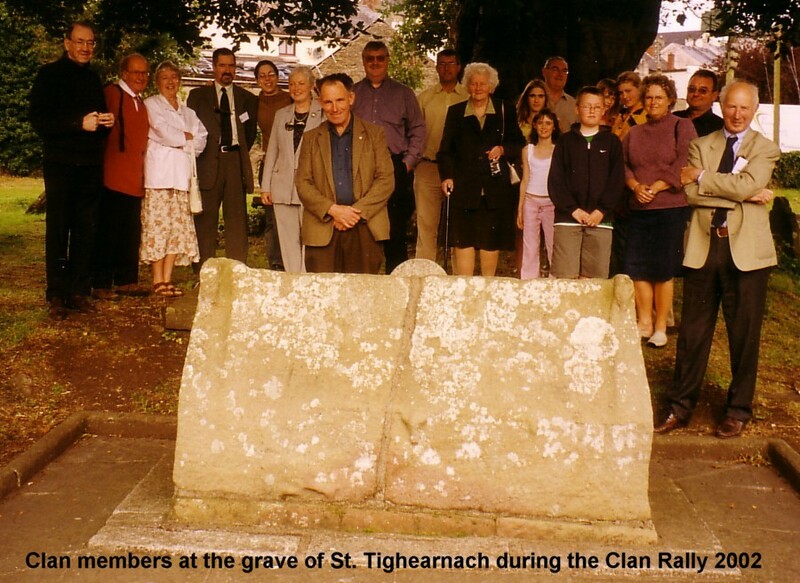 The first photo shows some of the attendees at the grave of St. Tighearnach at Clones. Centre is Cahir Tierney, Clan Chieftain with the Chairman of Carrickmacross Urban District Council. On the right a group of clan members on a historic tour. Well its over for another year, and what a gathering! It was great. It didn’t all work out 100% the way it was planned but we had a fantastic time anyway. In excess of 30 members attended and even though we were small in numbers Carrickmacross, and County Monaghan, knew that the Tierneys were back. On the weekend of August 30th, 31st and September 1st Tierneys from far and wide gathered in Carrickmacross for their annual clan rally, the first such Tierney gathering in nearly 600 years in their ancient kingdom of Fearnmhuighe. This kingdom, which once stretched from Carrickmacross to Sliabh Gullion, in County Armagh, was once ruled jointly by the O’Tierney and the O’Kieran clans, until they were overthrown by the McMahon Clan in a power struggle for even then was called ‘the Border Area’. This was the area that divided the Kingdom of Uladh [Ulster] from the Kingdom of Breaga, two of the major kingdoms of Old Ireland. The clan was warmly welcomed to Carrickmacross by Mr. Eugene O’Gorman, Cathaoirleach [equivalent of Lord Mayor] of the Carrickmacross Urban District Council. The weekend commenced with registration and a ‘get-to-know-one-another’ session in the Shirley Arms Hotel. Saturday was a ‘work day’ with various seminars. Mr. Larry McDermott, a local historian, spoke on different aspects of local history, which included information on local family names, clan rivalry in the area, the importance of Fearnmhuighe as a ‘buffer zone’ between the two great kingdoms of Ireland, and of Tierney history and the relationship of the clan with the barony of Farney. A detailed history of the four Tierney Septs of Ireland, and their origins, based on his research to date, was given by the Clan Organiser, Cahir Tierney. The evening ended with a lively musical extravaganza from members of the local branch of Ceoltas Ceoltórí Éireann, a national traditional music organisation. On Sunday the clan members enjoyed a tour of County Monaghan, visiting Saint Tighearnach’s Cemetery, the clan patron Saint, where they were met by local historian Paddy Boylan who gave a talk on the history of the cemetery and then proceeded to give a guided tour of the town of Clones, pointing out places of historical interest and folklore. Following lunch at the Ulster Canal Stores and Heritage Centre, we were shown an exhibition of the famous Clones Lace, and where Mr. Boylan explained to us the differences between it and the also famous Carrickmacross Lace, which was also on display. The tour then proceeded to St. Tierney’s Church, Roslea. From there we went to Cairnmore, an ancient burial site of the Kings of Ulster. From this site one can see at least eight counties of Ireland. We then visited the church at Scotstown in whose cemetery are buried many Tierneys, including the family and ancestors of clan member Betty Connolly. It was then on to St. Macartan’s Cathedral, Monaghan where the clan attended a special Mass celebrated by Dr. Joseph Duffy, Bishop of Clogher. Music for the occasion was provided by Orlaith Tierney. Maureen Parsons and Betty Connolly read the readings for the Mass and the Mass gifts were presented to Bishop Duffy by the Tierney family, Martin, Jayne and Joseph. On the way back to Carrickmacross, after the Mass, we visited the church at Clontibret, which was built by Rev. Cannon Thomas Tierney who was our ‘interesting Tierney’ in issue 5 [Jan 2002] of the newsletter. I would like to thank Betty Connolly and Joseph ‘Tierney’ Duffy [whose great-grand uncle was Rev. Cannon Thomas Tierney] for the commentary, with interesting facts of history and folklore, which they gave throughout the entire journey and pointing out all the places of interest with and without a Tierney connection. Their contribution made the trip a very special and memorable one. The following are a list of those who attended the various functions during the Rally weekend: Cahir & June Tierney; John Waring, Dublin; Orlaith Tierney, Dublin; Martin & Jayne & Joseph Tierney, London; Joseph ‘Tierney’ Duffy, Dunraymond, Monaghan; Joan Horgan, Kells; Betty & Peter Connolly, Smithboro, Monaghan; Maureen & Brian Parsons, Kent, England; Peter & Jane & Darragh & Seán & Eoghan Maher, Galway; Aron Cox & Patricia Tierney-Cox & Amy & Sarah Cox, Longford; Noel Tierney, Dublin; Noel & Bridie & Yvonne Tierney, Shercock, Co. Cavan; Sharon Finnegan & Colm, Carrickmacross; Oliver, Stella & Mary Tierney, Dublin; Gerry Tierney, Dublin; and special guests, Kevin O’Gorman, Larry McDermott and Eugene O’Gorman of Carrickmacross. We were also joined, for the Mass, by Clan member Sr. Rosario Brady’s brother and his wife and a number of other people from Monaghan town. The 2006 rally was held at The Holiday Inn Hotel, Newton, Boston, USA, on July 7th 2006. This was the first time in the long history of the Tierney families that a gathering was held in the U.S.A. The Gathering was orchestrated and organised by Elaine Tierney and we are indeed indebted to Elaine for all her hard work and enthusiasm that went to making the event so successful. At registration each attendee received a Welcome Pack, which was beautifully put together by Elaine. These packs contained the agenda for the evening together with a synopsis of the presentations, which were to follow the Dinner and an ‘Attendance Certificate’, which was a novel idea. Following our meal there was a reading by Maurice Tierney of poems by Seamus Heaney and Patrick Kavanagh. This was followed by a presentation talk on “A History of the Tierney Surname and its Various Septs” by Cahir Tierney. The evening was then capped off with plenty of chat and a great singsong with our guest musician. The next Clan Rally will be held in September 2008. This time we are joining forces with former clan allies; The O’Kennedy Clan, The MacEgan Clan, The O’Meara Clan and The O’Meagher Clan. Meetings have been held with representatives of these clans and other interested parties and as a result the planning is progressing a satisfactory manner. The rally is being centred in Nenagh and the surrounding area in North Tipperary. This is the former Barony of Lower Ormond and is close to the homeland of the Ó Tierney Clan, which was just about five miles south-east of Nenagh. Their history has in recent years come to light through the finding of documents known as 'The Ormond Deeds'. A Clan Rally is a great occasion for any clan. To help make the occasion more special we invite you to join us in Tipperary. You do not have to be a society member to participate - you only have to be there. All are most welcome. So please come and join us. FOR FURTHER DETAILS CLICK HERE TO GO TO THE 2008 RALLY WEB PAGE. Mail address; Cahir Tierney, Naomh Antoine, 53 Ard Aoibhinn, Athenry, Co. Galway, Ireland. Cumann na gClann Uí Thighearnaigh – The Tierney Clans Society.